Not all users in Noko are allowed to merge projects. If you can't, please ask a leader or supervisor to do it for you. Learn about permissions in Noko. So you’ve been working on two different projects that have now become one? 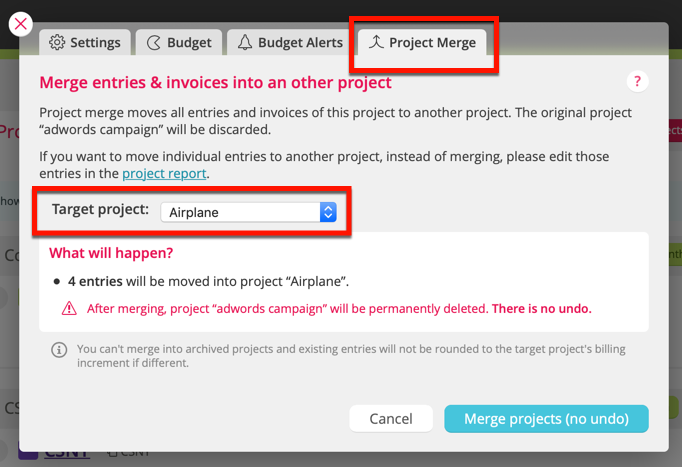 Noko's project merge tool makes it easy to merge two projects together. Project merging moves all entries, invoices and expenses of one project into another project. Go to your Projects tab in the green navigation sidebar. Here you'll see a list of all the projects you've already created. Move your mouse over the project that you want to merge. Then click on the settings button to open the Project Settings dialog. After the merger the project will be permanently deleted so make sure to double-check which project you’re opening. In the Project Settings menu, click on the Project Merge tab. Under this tab, you'll find the tools you need to merge your projects! Start by choosing your Target project. The Target project is the project that you want to merge this project into. Note: you can’t merge projects into archived projects. To do so,You must first re-activate the archived project and then you'll be ready for the merger. Before you click the 'Merge projects' button, be sure to do a double take. Check the notification below the "target project" to be sure the entries being merged are correct and that the project being deleted is correct. All of your entries and invoices in the current project will be merged into the target project. 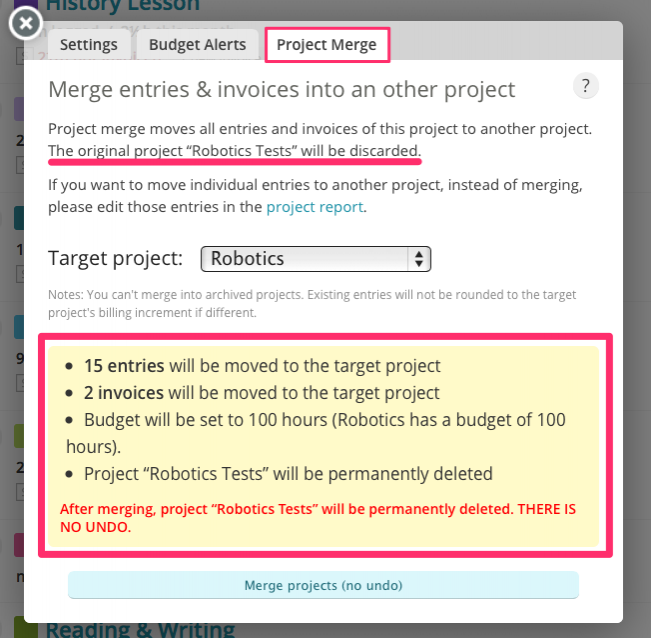 The current project will be permanently deleted so double-check all of the info before merging your projects! 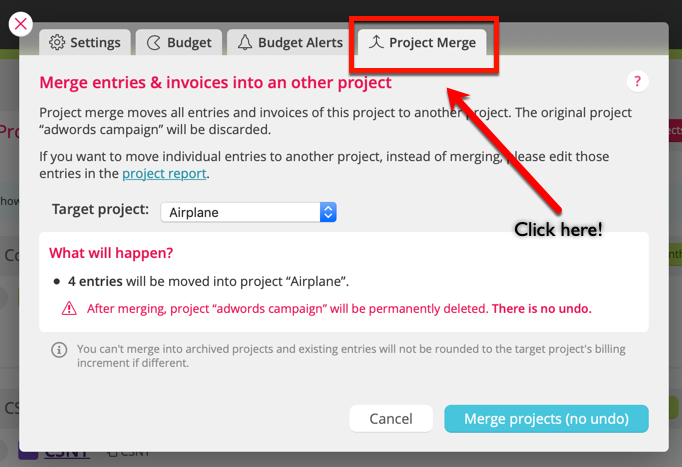 If you’re happy with what’s being merged, be bold and hit the 'Merge projects' button. After you’ve done this, the original project will be permanently deleted and all your entries and invoices merged with the target project. Do you want to merge more than one project together? Just repeat the steps above for each project you want to merge.